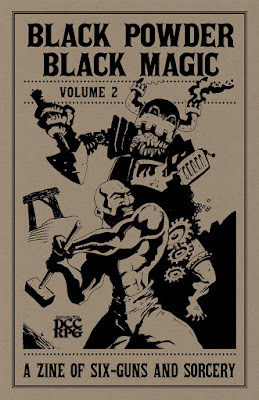 At the time of this writing, I have not received contributor copy of this compilation, although I do own all of these adventures in their initial appearances. When I have this in my hands, I will update this entry. 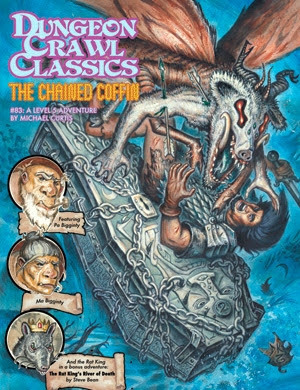 DCC #83, The Chained Coffin, by Michael Curtis, is available both as a stand-alone module, and as an amazing boxed set. I was lucky enough to be given an (uncredited) chance to playtest this adventure, and it went very, very well. I have already written about this adventure here, and my comments still stand. In addition, I will point out that The Chained Coffin Companion contains most of the creatures one would otherwise wish statted up from Manly Wade Wellman's stories. It is extremely well done. I have still not had the chance to run Steve Bean's companion adventure, The Rat King's River of Death. As much as I enjoyed reading this adventure, I have to question its inclusion in an adventure that ended up in an otherwise wonderfully themed boxed set. Mind you, it is not the adventure I am questioning, but how it plays into the fantasy Appalachian theme. 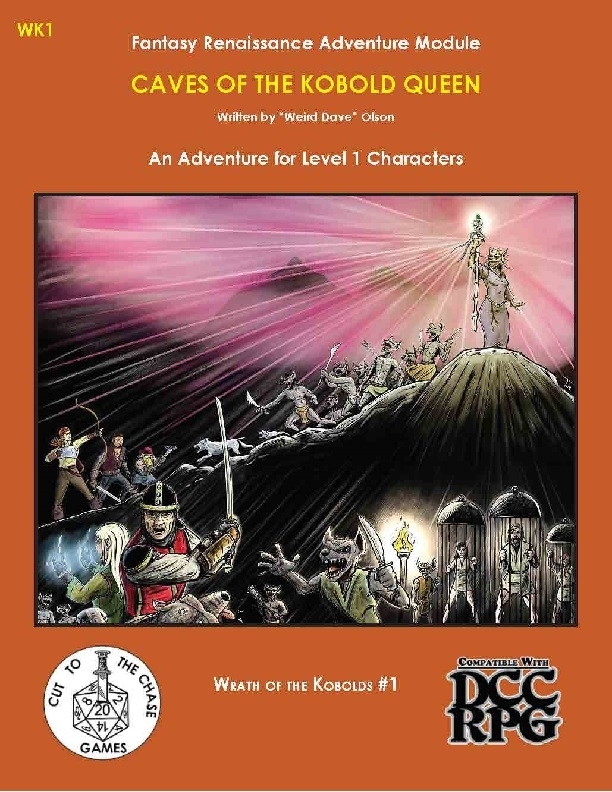 And now I turn with a sad heart to Caves of the Kobold Queen by "Weird Dave" Olson and published by Cut to the Chase Games. This adventure was part of a kickstarter campaign that includes Pathfinder, 5th Edition Dungeons & Dragons, and Swords & Wizardry versions, as well as the Dungeon Crawl Classics version. This was probably a decent adventure for its original rule set, but the conversion to Dungeon Crawl Classics is lazy at best. From a town of 250 people offering a reward of 100 gp per adventurer (Cut to the Chase could have made this sp without having to make any other change) to a calls for social interaction and Charisma checks to resolve role-playing (and DCC doesn't have Charisma as a stat), there is a lot the prospective judge will have to fix in order to use this adventure. The town of Ormkirk (which is an excellent name, by the way) has a 6th level cleric. a 1-in-50,000 supra-mortal accomplishment in the DCC rules. Why not simply use the friar stats provided in the core rulebook? Why is this ulta-powerful NPC there? The obvious answer is that the person who did the conversion didn't "get" Dungeon Crawl Classics. Monsters are ho-hum, with none of the Make Monsters Mysterious suggestions given by the core rules, beyond a table of random physical traits for kobolds. At one point, an entire dungeon level is resolved by skill checks. It is entirely possible to create a non-mapped space in DCC that needs to be resolved by player cunning and PC skill - Harley Stroh did this extremely well in both Peril on the Purple Planet and The Lost City of Barako. In Caves of the Kobold Queen, a chart of area descriptions, as well as the chart of encounters, would have gone a long way to resolving this problem. Also, while an appendix of statistics is a useful addition to an adventure, I hate it when the statblocks are not included for encounters in the adventure text. This makes sense in games like Pathfinder, where the stats would easily take up a full page, but it is inexcusable in Dungeon Crawl Classics. (1) Examine all rewards, and alter where necessary. The adventure assumes magic items are standardized; this should not be true in Dungeon Crawl Classics. (2) Make Monsters Mysterious! The adventure assumes that the townsfolk know what the kobolds are, but that doesn't mean that the PCs must. Still, if you want to use the full WK series, you might wish to assume that the kobolds are a roughly known quantity, and add some unexpected monsters to the Talon Hills. Also, the black bear in Area 6 of the Ambush Cave could be something far more interesting, even if you use the same statistics. (3) Especially, devise an additional chart to describe areas of the middle level of the kobold caves. Consider using the dice chain instead of fiddly modifiers for the skill checks. The base die should be linked to occupation, so that dwarves and miners make the check with 1d20, for instance. 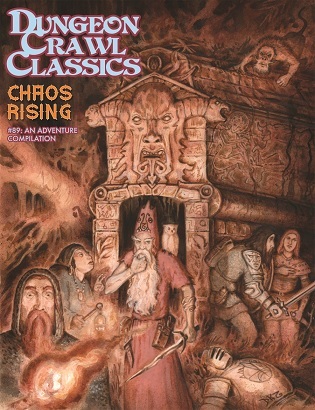 (4) If you are going to continue with the series, you will want a gnome class, such as the one in Crawl! fanzine #6. If you are not going to continue, you may wish to alter any mention of gnomes. Or not. Their language is listed in Appendix L, after all. (5) If you wish to continue with the series, the death throes (curse) of the Kobold Queen are important. Don't skimp on them. In fact, I would say they are not enough. (6) "Weird Dave" Olson tells you repeatedly that it is okay to fudge. I believe that the adventure will be better if you do not. As far as fudging the sacrifice timing goes, perhaps I missed the specified timing the judge might fudge. I would come up with a time table, based on when the PCs first reach the kobold caves, and then stick to it! If the PCs dawdle, the results are on them. 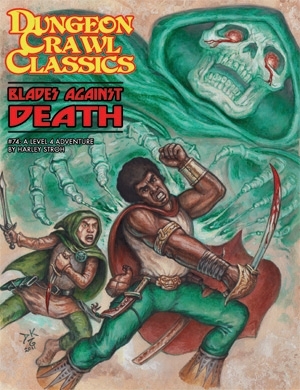 None of the foregoing is intended to prevent Cut to the Chase Games or "Weird Dave" Olson from continuing to create products for the Dungeon Crawl Classics game. I hope to see updated pdfs at some point, or additional adventures, which make better use of the Dungeon Crawl Classics rules. If updates occur, I will update this listing. In the wild and rocky hills north of the town of Ormkirk, dangerous kobold raiding parties have been striking at travelers and townsfolk alike for several weeks, stealing them away under cover of night from out of their homes. Desperate for help in rescuing the missing people, Ormkirk’s townmaster sent out a call for adventurers to hunt down the raiders and recover the kidnapped men. 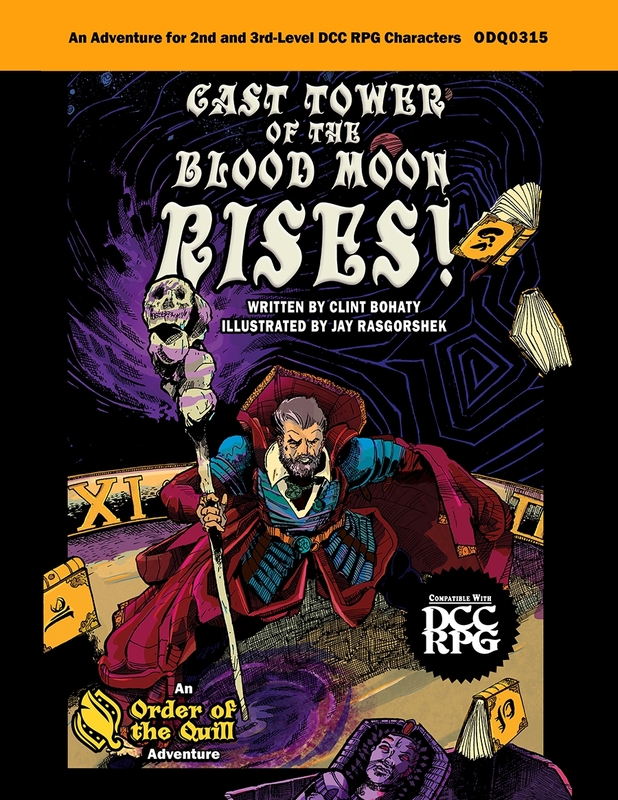 Cast Tower of the Blood Moon Rises!, written by Clint Bohaty and published by Order of the Quill, is an adventure designed for 2nd-3rd level Dungeon Crawl Classics characters. The art, by Jay Rasgorshek, is fantastic, and I would definitely be happy to see more of his work in future modules. 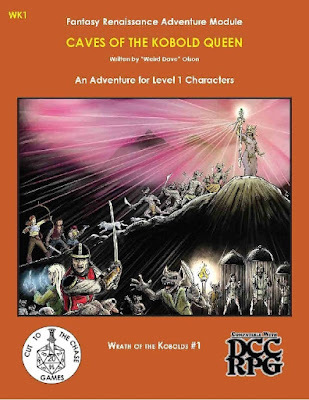 The adventure is designed to play for two four-hour sessions, and so is not particularly useful as a convention module unless you can plan for two sessions with the same players. Home play is, of course, another thing. This adventure introduces Myassari, the patron stenographer of birth and decay, although no part of a patron write-up is included (Order of the Quill makes this available as a free pdf). 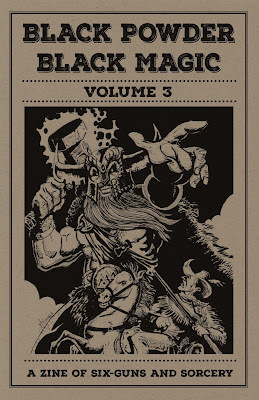 The Dungeon Crawl Classics core rules talk about ritual magic, and this adventure gives us the example of the Foul Hand Ritual, which might be used to achieve immortality. There is one element in the adventure, a personal relationship, which seems more fitting for a Pathfinder or 3rd Edition Dungeons & Dragons adventure to me, where you might encounter a being with mixed ancestry. This seems stranger in a game where demi-humans are rarer, and more remarkable. Yet the Appendix N fiction that Dungeon Crawl Classics was based on contains the voices of some very different authors. Different takes on the same basic material should be celebrated, I think. I haven’t had a chance to run this adventure yet, but I certainly enjoyed reading it. Expanding the Bloomingshroom Forest and its Mushroom Men could give the PCs a cool place to explore, and provide a backdrop to additional adventures of the Judge’s own devising. The Carnival of the Damned was written by David Baity and published by Purple Sorcerer Games. Disclosure: I received a proofreading credit on this product. 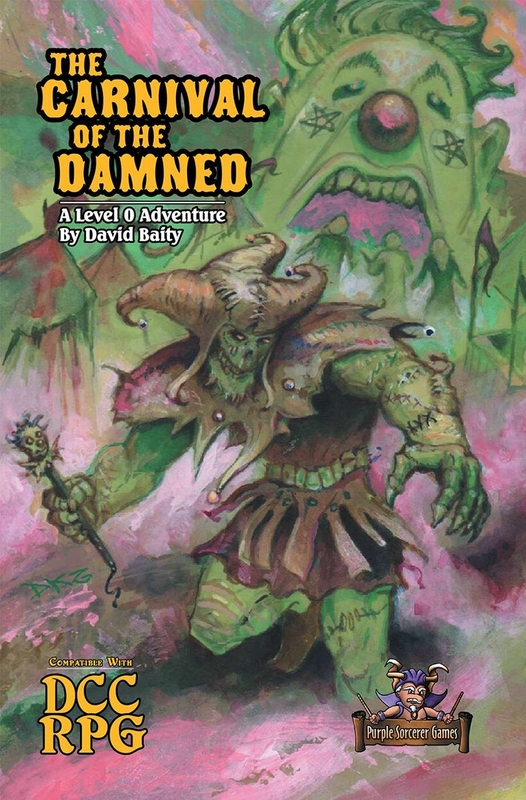 This is, to put it quite simply, the meatiest 0-level funnel written for the Dungeon Crawl Classics system to date. Not only is there a main book, which is over 140 pages long, but there is a pdf containing printable images, paper miniatures, and patron spell printouts for Gelos, a complete patron written for the module. Gelos is the god of laughter and madness; his followers are the insane and those who find humor in dark deeds. Gelos feeds on the emotional energy from laughter of all types, from the laughter of a child playing with a new pet to the twisted cackle of a murderer who finds sadistic glee in practicing his murderous art. The Laughing God often reaches out to those forgotten in dank dungeons and sanitariums, finding their chaos-filled souls a delicious feast for the taking through twisted bargains. The prospective judge can easily see how this patron would be useful not only in the adventure presented, but in long-term campaign play. The adventure takes place within a carnival. The carnival includes 28 fully described encounter locations, such as the Tattoo Parlor and the Bone Coaster, as well as 12 random encounters, all of which are appropriate to the setting. The judge may select attractions from those listed, and has the means to close off areas of the carnival, so that even players who have already experienced The Carnival of the Damned can enjoy a second – or even a third – play-through. It should be noted that this is not simply a bunch of themed encounters slapped together – there is a compelling story behind the carnival’s appearance. By the time the PCs encounter the Black Jester, they may actual feel sympathy towards him. And there’s clowns. Lots and lots of clowns. DCC #82: Bride of the Black Manse, written by Harley Stroh and published by Goodman Games, is a fantastic piece of work. In addition to the cover and cartography by the always stellar Doug Kovacs, there is interior art by Fritz Haas, Doug Kovacs, Peter Mullen, Russ Nicholson, and Stefan Poag. The Russ Nicholson art is so amazing that I photocopied it to use as visual handouts during the game. Anyone familiar with the works of William Hope Hodgeson cannot help but feel his ghostly presence invoked by this adventure. The PCs investigate a haunted house in a gothic tour-de-force which manages to be genuinely creepy. Because the adventure is set up to play out in real time, and the haunted house changes as midnight approaches, the players soon gain a real sense of urgency. Fail to play that part as written, and you will do your players a real injustice. When I ran this at home, I used the set-up wherein the party wizard, having been rejected initially by the archdevil Mammon, managed to survive after his luck ran out. Marked by the evil being, he was drawn eventually to the Black Manse, wherein the adventure unfolded. This adventure definitely got high marks at our table, although the party skirted a full understanding of the horrible choice illustrated on the adventure’s cover. To say that Bride of the Black Manse is worth the cover price is an understatement, but this module also includes Blood for the Serpent King, by Edgar D. Johnson. 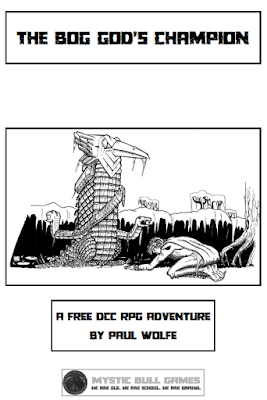 This adventure is a short dungeon crawl in a steamy jungle, and sees the return of the Emerald Cobra from 3e version Dungeon Crawl Classics modules. 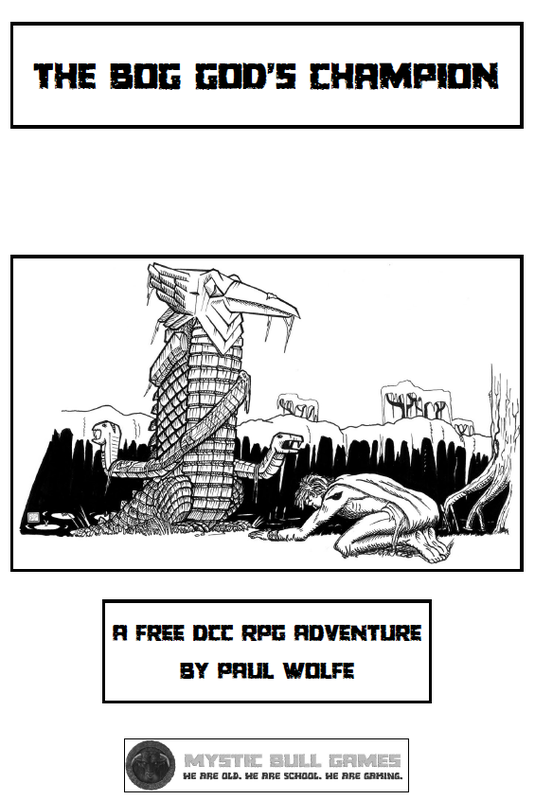 The Bog God’s Champion is a free unofficial Dungeon Crawl Classics adventure by Paul Wolfe, published by Mystic Bull Games. It is available on the Mystic Bull Games website. The adventure makes use of the “Patron Monday” feature on the Mystic Bull blog, particularly (but not exclusively) the patron Myrddin. There are a couple of small errors and omissions (Con instead of Stamina; specifics of Mohgd’s disease; what happens if you follow the corpse candles in the swamp?) but nothing that a good judge couldn’t handle. Overall, what you get is an interesting, flavorful location-based adventure with a storyline that the PCs can engage in however they so desire. 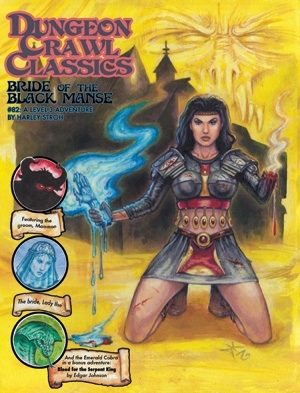 The adventure could easily be used in a Crawling Under a Broken Moon or Mutant Crawl Classics setting as well, if the judge were willing to do minimal work. You could just as easily place it on a Venusian swamp in Crawljammer or some out-of-the-way portion of the Purple Planet. Even if you didn’t want to run the adventure as written, it can easily be cannibalized for spare parts. The rules for weather and moving through the bog, the creatures, and the seven interesting magical items could become part of the judge’s toolkit with ease. And, again, it is free. 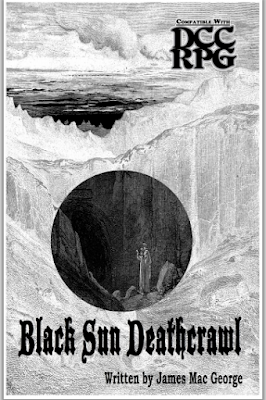 Black Sun Deathcrawl, written by James MacGeorge for Aleph Null Publishing, is the bleakest thing in the Dungeon Crawl Classics cornucopia at the time of this writing. Don't bother trying to out-bleak it. There is no point. Man, I wish I had written this thing. Not because I am a nihilist, but because it is just so damn good. I don't even know how you could use it, except as a one-shot....unless you played through Black Sun Deathcrawl and then moved back in time to give your PCs a chance to avoid that bleak future. Or maybe as a trip to another plane of existence. Or maybe if you have a TPK, and you really do want to let your PCs wake up in hell. If you go with this option, make new Black Sun Deathcrawl characters, and then shuffle things up so that each player is playing someone else's PC. This is both a setting and an adventure. The adventure is not set up to allow you to "win". It is what it is. If this isn't being run as a one-shot, you'll have to provide your own win conditions. Disclaimer: I wrote a Varmints! entry for this volume. 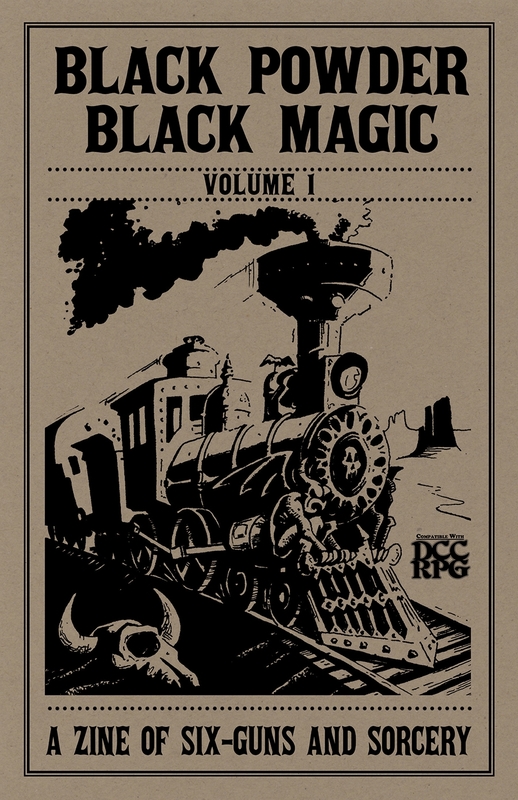 Volume 3 of Black Powder, Black Magic is written by Carl Bussler and Eric Hoffman, with contributions by Daniel J. Bishop and Noah Stevens, and is published by Stormlord Publishing. 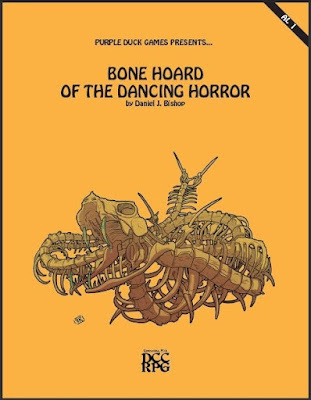 This volume continues where the second one left off, providing the judge and players with useful stuff for a weird western setting. First off, there is an article on Fumbles in Black Powder, Black Magic, which provides unique fumble tables for era-appropriate firearms. The Kung Fu Monk allows players to run characters similar to David Carradine's character in 1972-75's Kung Fu. This is a pretty welcome addition, indeed! Spellburning with Demon Ore is exactly what it sounds like, although a bit more complicated than the title implies. Strange Loot is a list of 30 unusual items you might recover in the Weird West of the Dark Territories. It is followed by The Red Duke, a full patron write-up for the titular being first encountered in Volume 1. It's Explosive: Black Powder is the first in a series of articles about explosives. In this case, black powder. Finally, Noah Stevens supplies The Indigo Signalman's Lantern, one of the many strange items one might someday encounter in Brimstone or beyond. If it seems to you that this is a full issue, that's because it is. 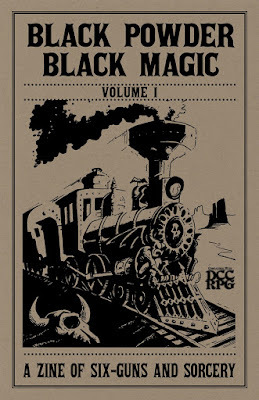 Black Powder, Black Magic Volume 1 (a zine of six-guns and sorcery) was written by Carl Bussler and Eric Hoffman for Stormlord Publishing. It is the first volume in a series bringing Weird Western fiction to the Dungeon Crawl Classics multiverse. The authors wisely choose to make the first volume about introducing the setting – largely through introducing the zero-level schlubs who will seek their fortunes in Brimstone, and then giving them a chance to do so. It should be noted that this is not the historical Wild West, but rather an altered version where the Dark Territories of the United States of America form the primary arena for play. A map on page 3 shows the relationship between the States, the Dark Territories, the Native Nations of the Navajo and the Lakota, and the Republic of California. The year is 1880. The product is broken into several sections. This is a nice bit of fiction that the judge can read aloud to the players, and which prompts several steps in the creation of newly-minted 0-level adventurers. For obvious reasons, it references later sections in the zine. It also adds a nice bit of flavor, bringing the setting to life in a way that no textbook-style entry could. A listing of major events from the start of the California Gold Rush in 1848 to the Southern Dakota Railroad being completed in 1880. The events chosen are significant, but the details are left for the judge to fill in. Rules for creating 0-level characters suitable for Brimstone and other regions in the Weird Western setting. This includes sections for appropriate Occupations, Tokens of the Past, Motivations for Heading West, and Common Names in Brimstone. Tokens of the Past replace random equipment, and include items like a ticket to the Ford Theater and a human scalp. Motivations for Heading West give your starting PCs reasons for leaving the greener lands to the East. Common names prevent a gaggle of PCs called Conan or Elric taking away the feel of the setting. They are also an excellent resource for the judge when naming NPCs. You can hardly run a Western setting without rules for pistols, rifles, and shotguns. Volume 1 includes all of these, as well as cannons, Gatling guns, and even elephant guns. This section includes information about firearms manufacturers and a Mighty Deed of Arms for fanning the hammer of a revolver. In the Weird West of Brimstone, a ritual called The Soul Rending resulted in a new twist in the wars of Hell: A demon slain on its home plan explodes upward in a scatter of metal fragments that finds its way into mortal realms. Depending upon its quality, the ore can be used for various purposes, and all of it is valuable. A level-0 funnel by Eric Hoffman, which is more than suitable for the setting. This also includes The Red Duke, a potential patron who is not developed in this volume. A spot of fiction by Carl Bussler which takes place in 1878 (according to the Timeline of Events on page 3). This short bit of Weird Western fiction puts the events in The Devil’s Cauldron into their proper perspective…the judge may wish to read it aloud after the adventure is done. Since the issue starts with a pit of fiction in the form of the Introduction, this is a fitting conclusion to the first volume.